Trying to figure out if these old Bobby Grace putters have any value. All except one (the black FBX) are unused. Back in the early 1990's I did some advertising work for Bobby Grace when he was in St. Petersburg, Florida. Before he was acquired by Cobra Golf and then MacGregor Golf. These putters are from the early years and all have the original leather headcovers except The Heavyweight Champion head cover is cloth and in the shape of a boxing glove. From left to right: The Heavyweight Champion. I believe VJ Singh used one of these. FBX. I used this putter myself for over 15 years. It's the only used club of the group. The 2200. The same as the version he made for Cobra but without the Cobra logo. The Pip-Squeek with early HSM insert. The Pip-Squeek with a milled face and no insert. The Little Man with HSM insert. The Fat Lady Swings autographed by Nick Price. Early â€œpatent pendingâ€ model. Pay Day with HSM insert. The Fat Man with milled face. The Little Lady with milled face. AN-7 with HSM insert AN-7 with milled face and white Nick Price head cover. RH 34â€ T10 Circle T Newport 2 Button Back Putter. Same putter used by Koepka to win his 3 Majors. DM if interested. $2500 cash includes Headcover and shipping! Dave's Putter Profile: The Miura KM-009 "This classic toe-weighted design proves it is possible to match looks with performance." -Hoyt McGarity, President of Miura Golf. Miura Makes Great Irons (and Putters!) Since I've actually never owned a set of Miura irons (sadness), I'm actually going with a bit of faith on the first part of that title above. However, I've never met a person who has bemoaned anything about Miura irons. OK, so maybe I've heard some grumblings about price, which is why I don't own a set of them, but I have never heard anyone talk trash about the irons themselves. I do have first hand experience with Miura putters though, and to a putter, the build quality has been exceptional. Putters for Miura Golf are not just haphazardly produced to fill that fourteenth spot in the bag. They are a legit Miura product, and they live up to the Miura name. For reference, you can read my takes on the KM-007 and the KM-008 putters by clicking those links. Today, we are going to take a closer look at the newest Miura Golf putter model, the KM-009. "Although putters aren't our core focus, the Miura family has never attached their name to any product that did not live up to their extremely high standards." -Hoyt McGarity, President of Miura Golf. The KM-009 is not a Cameron 009 Let's get the potential elephant out of the way first. Some of you leading the putter-obsessed lifestyle are well aware that Scotty Cameron makes a 009 model as well. The Miura KM-009 is in no way intended to mirror that putter at all. In this case, KM-009 just happens to be the next number in the putter naming sequence. You saw the KM-007 and KM-008 numbers above, right? Though both the Cameron 009 and the Miura KM-009 are heel-toe-weighted blades, when you look at the putters, you'll quickly see that their common ancestor was a while back on the putter tree of life. These are cousins, not twins. With that out of the way, let's explore the looks and play of the KM-009. Looks The KM-009 is a classic in the looks category. I love the lines of this putter at address. Though the topline is rolled, it still has that overall rectangular profile that I like to see behind the ball. The one thing that stands out is the thickness of the topline. Here is a shot next to my Vault Anser 2 so you can see just how much thicker the top of the KM-009 is in comparison. This thicker topline is one of those putter visual elements that some of you will like, and some of you will not like. I had one friend tell me that the thicker top makes it appear closed to him. I don't get that, but the point is that these little visual tweaks will affect each of us a little differently. The white chrome finish is a bright one in full sun, but not to the point of needing to only look at it indirectly like a high polished stainless finish would require. You are not going to get Twilight-vampire sparkle with the sun overhead, but this finish is a bright one for sure. In terms of precision, the milling on this putter is pretty darn spectacular. I know that zero Miura fans are shocked at this, but even so, the tightness of the milling really stands out. I love that they have mixed in a bit of flair on the bottom with the giant logo. Most of the putter is subtle; then the bottom gives you BAM. Love that design element. The milled lines on the back corners are a cool aesthetic touch as well. Performance The KM-009 gave me a bit of a surprise on the course. I anticipated the feel being a bit heavy for my tastes, and it was a bit heavy feeling during the swing. No fault to Muira there, of course. My preferred head weight is around 345g, and the KM-009 weighs in at 360g. The extra weight does make it very stable during the swing, but I just like it a bit lighter. Again, you may go the exact opposite of me on this, preferring the feel of a heavier head. One aspect of play that sent me back to the spec sheet was the firmness of impact. In a blind taste test, I probably would have said that the KM-009 was made of stainless steel. It's not. The KM-009 is made of mild (carbon) steel, but it feels firmer at impact than what I usually associate with carbon steel. It's carbon though. I did the magnet test to be sure... The firmness culprit is likely that thick front section. There is a bunch of mass behind the ball at impact, this likely imparting that thicker/firmer feeling at impact. It's a thunker, not a clicker. The firmness is coming from mass, and not metal. Those of you who have rolled the thick-fronted Kronos Touch would know what to expect from the KM-009. Once you get used to the impact feel, you'll see that the overall feedback is excellent. You can definitely pick up the differences when the ball hits various parts of the face. Just play some dead-off-the-toe putts on those short downhillers, and you will feel how the KM-009 lets you know where the ball hit the face. All in all, the performance and play of the KM-009 is old school. It relies on shape and metal to roll the ball as opposed to modern materials and fancy groove technologies. It is probably not a putter that will make you immediately better on the greens once you roll it. This is more of a long-term relationship putter. You spend time with it, roll balls with it, discover its nuances, and with the investment in discovery, you will likely find that you have developed an effective putting relationship with this finely-crafted flatstick. And the price... Here is where things get crazy. The price on the KM-009 is only $400! Wild stuff there, right? Now before you frugal crusaders attack your keyboards, think about the fact that most premium putters in the market today are above $300, with the new 2018 Scotty Cameron Select line also costing $400. Like it or not, that's what these putters run these days. I actually thought that the KM-009 would cost more. Miura irons are expensive after all, and the KM-008 was priced at $450... The thing is, I have a feeling that this putter will be exactly what some golfers are looking for in a market that has not satisfied their needs. Some putterheads are not happy that the last few lines of Camerons have had the face insert, as opposed to being fully milled. The KM-009 is forged mild steel, through and through. Nothing but milled metal here. Milled putter purists should welcome this one with open arms. Miura Golf is known for making some of the finest forged irons in golf. Why would their putters be any different? Hopefully you have a Miura dealer near you so you can check out the Miura KM-009 first hand. If you've never rolled one of their putters before, you are in for a treat. I'm A Sucker Forâ€¦ For me, that statement finishes with longneck blades. I don't think that there is another putter that I pine for more for than the longneck. I've got a couple of sweet ones in the never part with section of my collection. One is an old Cameron Tel3 longneck Newport, and my copper twisty Byron longneck 006 may be the pinnacle of my putter collection, and probably going into the box with me when I take the old dirt nap. There was a span of time when discovering a new longneck resulted in an auto-purchase. These putters were the gamer of choice. Only the longneck could give me the face-balanced, non-malletness that I was looking for in a putter. Dave's putter corral was home to double-digit longnecks there for a while. #longneckissues And so, when I saw that Kronos Golf was rolling out the ample-necked Release blade, I knew that it was a putter that needed my close scrutiny. Spending Time with Kronos Many of us first learned about Kronos Golf on the TV show Shark Tank. Kronos' founder and designer delivered one of the most memorable, and emotional pitches in the history of that show. That episode got the Kronos Golf out there, and they have continued to put out some pretty solid video content. Here is a YouTube clip with a little more about the philosophy of Kronos. https://youtu.be/feX4U8VuhJo I first rolled Kronos putters back in 2015 when the Mandala and the Touch were entered in the Most Wanted Mallet and Blade competitions, respectively. The Mandala did great, placing fifth overall that year. That's including blades and mallets. Not too shabby for a small shop. Though the Touch didn't fare as well with the testers, I personally liked the thicker top line and overall blocky blade appearance quite a bit. That Touch found its way into my bag more than once after the testing was completed. Though ultimately a bit too heavy for me, rolling the Touch was a pleasurable putting experience. The Kronos Release https://youtu.be/8H2SwutHphk So let's take a closer look at the new Kronos Release. Obviously, the thing that is going to jump out at you with the release is the length of the neck. As necks go, the Release's neck is quite long. I've seen longer, but this one will stretch right up there with the other giraffes of the putter world. The effect of that neck comes primarily with toe hang, and with that the putter's playability. An Anser-style putter featuring a more traditional neck length fits a slight-arc stroke path, with the neck and head weighting matching the swinging and head rotation of that arcing path. By lengthening the neck, you push the toe hang toward being face-balanced, with the putter now playing more along a straight back-straight through path. What this means that the blade now plays more like a mallet, at least in terms of path. The huge mallets will still have significant MOI differences when compared to a blade, but having a blade that swings like a mallet hits the sweet spot for minimal arc players who don't like the look of huge putters. Face-balanced blades are amazing compromises for the big mallet-phobics. Specifications: Kronos Release 1-piece billet milled 11L17 carbon steel Physical Vapor Deposition finish 2.5 degrees loft, 70 degrees lie, 2 degrees draft 3:30 o'clock toe hang (nearly face balanced) Compass Scoredâ„¢ face 370 grams Standard with stepless steel shaft, leather cover and Iomic midsize grip Putter head milled and club assembled in San Diego, California. Looks: Kronos Release The PVD finish on the Release is outstanding. That's a subjective assessment, of course, but I love the way that other colors show up in the nooks and crannies of the putter. Nothing so overt that it distracts you at address, rather there are just little winks of color that you catch as you rotate the head. It's a top notch looking putter, and that PVD finish will protect the carbon steel nicely. You've likely noticed that someone's name is on the putter's neck. Spoiler alert, that's my name! I didn't even know that Kronos was offering this type of customization, so I was quite surprised to see this touch of personalization when I opened the box. This is a what that you could make this already unique putter even more custom and spepersonal. These putters could be used to mark births of kids, or other significant events like weddings. Imagine how excited your groomsmen would be this summer if you presented them with putters with something cool like Fairways and Greens on the neck. They'd be bros for life after that. It's a nice option for those interested. Feel, Alignment, and Play Notes: Kronos Release The Kronos Release plays exactly like a carbon steel longneck blade should play. The feeling at impact is deliciously soft, and paired with a pleasantly resonating tone. It gets an ooooh that's nice response when rolled. The Release does remind me of the Touch in many ways. I like the familiar, blockier appearance of the blade at address. For me, the more square the better when it comes to aiming the putter. Once you start rounding edges, my eye gets a little wandering. The blocky top line and simple sight line are well paired for my eye. Not very overt, but enough to be helpful. The Release feels best along a shallow swing path with limited head rotation, exactly like you'd expect. Unfortunately for me, this no longer reflects my current swing description. This past weekend, I spent a few hours with a putting coach and the Capto putting system. During the past year or so, it seemed like I was putting better with deep toe hang putters, directly contrasting what I thought that I knew about my putting preferences. I guess that I could have seen this coming as I have almost unconsciously migrated from long necks to standard necks, and then to flow necks over the past few years. Maybe the transition was a frog in a slowly warming pot thing, where I just didn't really know it was happening while it was happening. The Kronos Release still fits my slight arc path, but the capto sensor showed dramatically different result when we looked at face rotation. As it turns out, I rotate the head much more in my swing than I thought I did. Good or bad, this is my (new?) natural motion, and it's more suited to a flow neck than a long neck. Based on the data, it looked like I was fighting to release the Release a bit. This was a huge surprise, going against my years-long love affair with longneck putters. How can something I love not be good for me (re. beer)? Of course, I'll likely still game it here and there, when curiosity and emotion overpower data at gamer selection time. We all know that just sticking to that one putter would be boring anyway. Will 2018 Be the Time For KRONOS? 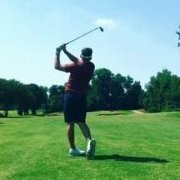 It seems like Kronos golf may be one to watch in 2018. There are lots of shops out there making milled putters these days. Let's face it, not all of them are innovative, or even interesting. Kronos seems committed on both of those accounts. The Release is deliciously atypical in today's putter corral. I can only think of a few available longneck blades out there that don't require custom production to acquire. Sure, I probably need to go short flow neck these days to hit the hole, but I like to think of myself as a longneck aficionado. The Kronos Release is a solid longneck offering. Did you see a putter on that blog page that you'd like to know more about? Any specific idea that jumped out? Anyone else out there a longneck lover? Fire off that 2Â¢ MGS folk!